When it's released, you'll be able to play Enderal without interfering with Skyrim saves. Enderal is a total conversion mod for Skyrim by German team SureAI, released in English in 2016. It's a whole separate setting and storyline, keeping the familiar controls and physics but changing plenty of other things—adding experience points and removing fast travel, for instance. 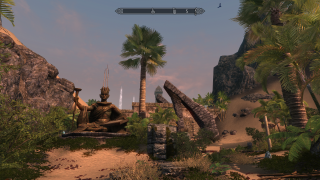 Originally, it had to be downloaded from SureAI's servers and installed over the top of Skyrim, meaning that it was impossible to switch between Enderal and Skyrim without reinstalling. That's set to change now that Enderal has its own Steam page. As the mod makers put it, "Enderal will have a completely standalone game and save game directory, so that the installation will no longer interfere with your Skyrim directory. You will be able to have both games installed at the same time!" Though it's not available for download yet, a release date will be announced this year. If you'd like to know more about Enderal, here are our first impressions from back in 2016.